Book Description: How far would you go to help a friend? Squidge and his new friend set off on a BIG adventure. They must cross icy seas and snowy mountains to help a lost polar bear find his way home. Will Squidge, a little elf with a nose for trouble, be able to help? And who will they meet on the way? Mary’s Review: Pack, pack, pack. What else would Squidge and Rumble need for their new adventure? Squidge didn’t know. All he knew was that as fast as he packed, Rumble unpacked. Squidge was an elf or at least he would be when he grew up. Rumble was a baby polar he had befriended and promised to take care of until they could find Rumble’s mother. That’s what this new adventure is all about…finding Rumble’s mother. They are confronted with an icy cold river and no boat to cross it. They are hungry but have nothing for Rumble to eat. They come to a very steep hole that Squidge can’t get down. Come see how they manage to work through these problems and others they meet on their new adventure. See how they learn that through team work and ingenuity they can work through anything. The illustrations are wonderfully cute and colorful. I recommend this book for ages 5-8. About the Author: Andrew Thomas is a primary school teacher in London, England. Book Description: How do you hide a polar bear? 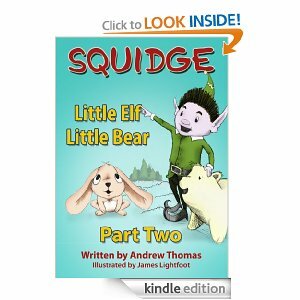 Squidge is a little elf who wants to do what the bigger elves do, but when he meets a new friend who needs his help, Squidge decides he is big enough for the challenge. Will he be able to find a hiding place in time? Mary’s Review: Squidge while out playing in the snow and wondering what he can do to grow and to keep from being bored hears a strange snuffling sound and when he can’t find it becomes very frightened and runs. While running he trips and falls. Imagine his surprise when he finds he has tripped over the snuffling sound…a very small white polar bear. Squidge tries to find out what is wrong with the tiny polar bear and discovers that he is hungry-very hungry. So Squidge does what any kind hearted little elf does and he befriends this little bear. He rescues him much like the Good Samaritan. He takes him home and feeds him and tries to find him a safe place to sleep, finally giving him his own bed. Little Elf not only makes a new friend, he has learned to show love, compassion and charity for his fellow being. This is a wonderful story to help teach these virtues. The illustrations are colorful and so cute that they will more than keep the attention of your child. Andrew Thomas, a primary school teacher, has been a working with children for the past decade, making up stories and sharing them with his class. He has written the ‘Squidge’ series of books and continues to add to the story of this little elf with a big personality. He lives in London, England, with his wife and son. This is his first series of books. Book Description: Who ever heard of an elf saving Christmas? Mary’s Review: Squidge wants so badly to do grown up things, but keeps being told that he’s too little. Well, he will show them. He sneaks into the workshop and starts the biggest, baddest machine of all and burns it up. Rather than own up to it and face the consequences, he runs and hides. Now begins his adventure of a lifetime resulting in his saving Christmas and learning that it’s okay to make mistakes as long as you are willing to accept the consequences for your actions. The illustrations are cute and adorable making a wonderful contribution to the story. About The Author: Andrew Thomas, a primary school teacher in London, England, has been a working with children for the past decade, making up stories and sharing them with his class. He has written the ‘Squidge’ series of books and continues to add to the story of this little elf with a big personality. He lives in London, England, with his wife and son. This is his first series of books.